I picked up this book for two reasons: 1) I started hearing about Sir Richard Branson very frequently 2) The tagline ‘Secrets They Won’t Teach You at Business School’ was appealing. 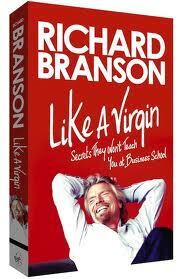 This book is a collection of all the articles and the Q&A by Sir Branson published at different times. I have to agree that the book was entertaining and a good account of Sir Branson’s life trail. It gave me an idea of the personality of Sir Branson. He is different than the usual entrepreneurs and unique in the way he runs the business. He is never afraid of taking risks and admitting failures and calling it quits when an initiative fails. He is also humorous and ambitious. While there are lot of useful information and interesting anecdotes, as the chapters passed by, they became repetitive. At the end, I felt like reading a pitching manual of Virgin group of companies rather than a book of business strategies. I wouldn’t have complained if not for the tagline “Secrets They Won’t Teach You at Business School”. This book gave an overview of all of the virgin groups and I will take a while before reading any other book by Branson. But that said, there was a style about Sir Branson that couldn’t be denied.